Affordably priced and with plenty of features, this motorized TV stand has become one of our most popular flat screen displays. 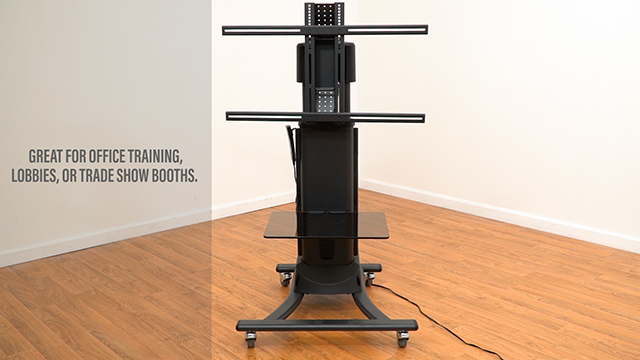 In this clip, we'll go over some of the standout features of this TV lift. With just the touch of a remote, this TV stand can adjust in height in seconds. Watch this feature demo to see this product in action. Great for office training, lobbies, or trade show booths. Adjust motorized bracket with the wired remote. Ranging from 31.5” up to 49” inches tall to provide optimal height for viewing. Add monitor screen sizes from 27” to 60” to complete your presentation. Also included is a wireless remote to control your tv stand from afar.